From top, left to right: Makati, Bonifacio Global City, Intramuros, SM Mall of Asia, Rizal Park, University of the Philippines Diliman and the skyline of Manila. 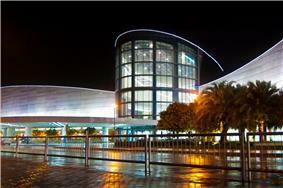 Its economical power makes the region the country's premier center for finance and commerce. 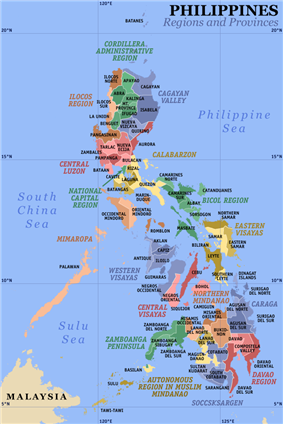 NCR accounts for 37.2% of the gross domestic product of the Philippines. The region was established in 1975 through Presidential Decree No. 824 in response to the needs to sustain the growing population and for the creation for the center of political power and the seat of the Government of the Philippines. The Province of Manila, the progenitor to the present-day Metro Manila, is one of the eight original provinces that revolted against the Spanish colonial rule in the Philippines. The province was honored as one of the sun rays in the Flag of the Philippines, with each of the eight sun rays symbolizing one of the eight revolutionary provinces. A historical province known as Manila encompasses the former pre-Hispanic kingdoms of Tondo and Maynila. It became the capital of the colonial Philippines, with Manila (Intramuros) serving as the center of colonial power. Mariquina also served as the capital from 1898-1899, just as when the sovereignty of the Philippines was transferred to the United States. The province was dissolved and most of it was incorporated to the newly created province of Rizal in 1901. Since the Spanish colonial period, Manila was considered as one of the original global cities. The Manila galleon was the first known commercially traveled trade route that sail the Pacific for 250 years, bringing to Spain their cargoes of luxury goods, economic benefits, and cultural exchange. During the American period, at the time of the Philippine Commonwealth, American architect and urban designer Daniel Burnham was commissioned to create the grand Plan of Manila to be approved by the Philippine Government. The creation of Manila in 1901 is composed of the places and parishes of Binondo, Ermita, Intramuros, Malate, Manila, Pandacan, Quiapo, Sampaloc, San Andres, San Fernando de Dilao, San Miguel, San Nicolas, Santa Ana de Sapa, Santa Cruz, Santa Mesa and Tondo. Meanwhile, the towns and parishes of Caloocan, Las Piñas, Mariquina, Pasig, Parañaque, Malabon, Navotas, San Juan del Monte, San Pedro de Macati, San Felipe Neri, Muntinlupa and the Taguig-Pateros area were incorporated into the province of Rizal. Pasig serves as its provincial capital. In 1939, President Quezon established Quezon City with a goal to replace Manila as the capital city of the country. A masterplan for Quezon City was completed. 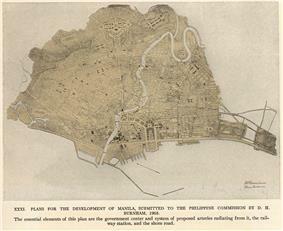 The establishment of Quezon City meant demise of the grand Burnham Plan of Manila, with funds being diverted for the establishment of the new capital. World War II further resulted in the loss most of the developments in the Burnham Plan, but more importantly, the loss of more than 100,000 lives at the Battle of Manila in 1945. Later on, Quezon City eventually served as the national capital from 1948-1976. It was reinstated back to Manila through Presidential Decree No. 940 owing to its historical significance as the seat of government of the Philippines since the Spanish colonial period. Presidential Decree No. 940 states that Manila has always been to the Filipino people and in the eyes of the world, the premier city of the Philippines being the center of trade, commerce, education and culture. The Pasig River Ferry Service run by the Metropolitan Manila Development Authority is the ferry shuttle system of Metro Manila. It traverses the Pasig River from Plaza Mexico in Intramuros to Barangay Pinagbuhatan in Pasig. Although it was referred to as a ferry, it is more akin to a water bus. It has 17 stations, but only 14 are operational. The Ninoy Aquino International Airport (NAIA) located in the cities of Pasay and Parañaque is the premier gateway and the only airport in the region. NAIA is the country's busiest airport. 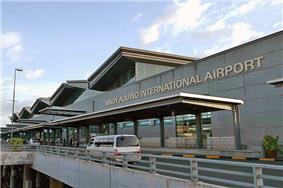 The other airport that serves Metro Manila is the Clark International Airport located in Angeles, Pampanga. Façade of Ninoy Aquino International Airport Terminal 3, the busiest airport in the country. Metro Manila will have its bus rapid transit system operational by 2018. The 27.7 kilometer proposed BRT system will traverse Commonwealth Avenue up to the Manila City Hall. The planned BRT system costs ₱4.9 billion ($109.5 million) and will have a fleet of 300 buses and 32 stations. Bus franchises in the region are regulated by the Land Transportation Franchising and Regulatory Board. The Express Connect Bus is the express bus system that runs from its dispatch terminal in Fairview up to the central business districts along EDSA. It aims to cut travel time substantially and provide a faster, safer and more convenient bus service to commuters, who are usually caught at the heavy traffic across the metropolis. The Philippine National Railways operates a commuter rail service in Metro Manila called the PNR Metro South Commuter. Its main terminal station is located at Tutuban in Tondo. When the LRT Line 2 West Extension is completed, Tutuban may become the busiest interchange station in the metropolis, adding another 400,000 people from the current 1 million people Tutuban Center attracts. LRT Line 1 is planned to be extended up to Bacoor in Cavite. A second extension, the LRT Line 6, would link Bacoor with Dasmarinas further along Aguinaldo Highway. LRT Line 2 on the other hand will be extended both eastward and westward in the future, adding about 3-5 stations. A new line was proposed, the Manila Metro Rail Transit Line 7. If constructed, it will connect Metro Manila to the province of Bulacan upon completion. Furthermore, a common station, connecting Line 1, Line 3 and the future Line 7 is planned, although bureaucracy in the Department of Transportation and Communications, corporate feud and issues related to its proposed location are hindrances of its construction. 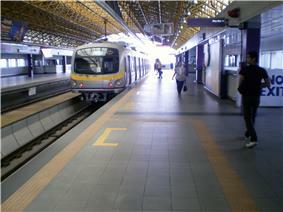 The Manila Light Rail Transit System (LRT) operates the LRT-1 and the LRT-2. 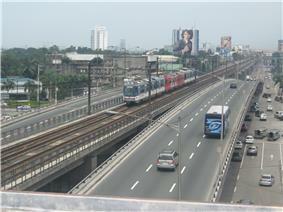 On the other hand, the Manila Metro Rail Transit System (MRT) operates the semi-circular line along EDSA, MRT-3. Line 1 has a weekly ridership of 560,000 people. In February 2014, a total of 14.06 million passengers took Line 1 while 6.13 million took Line 2. An LRT Line 2 train arriving at Araneta Center-Cubao Terminal Station. At present, the construction of the Metro Manila Skyway Stage 3 and the NAIA Expressway Phase 2 is ongoing, which are part of the Metro Manila Dream Plan. Other ongoing projects in the dream plan include the rehabilitation of EDSA, and the construction of the missing road links for the circumferential roads (e.g. Taft Avenue Flyover, Metro Manila Interchange Project Phase IV). Prominent radial road include the Radial Road 1, composed of Roxas Boulevard and the Manila-Cavite Expressway (Coastal Road) that connects Metro Manila to Cavite, Radial Road 3 or the South Luzon Expressway that connects Metro Manila to Laguna, Radial Road 6, composed of Aurora Boulevard and Marcos Highway that runs up to Rizal and Radial Road 8 or the North Luzon Expressway that serves as the gateway to the north. An important circumferential road is the Circumferential Road 4, the Epifanio de los Santos Avenue or more popularly known as EDSA. It traverses the cities of Pasay, Makati, Mandaluyong, Quezon City and Caloocan. MRT Line 3 follows the alignment of EDSA, from Taft Avenue in Pasay up to TriNoma, terminating before it reaches Caloocan. Circumferential Road 5 serves the people near the regional limits of Metro Manila and also serves as an alternate route for Circumferential Road 4. The roads of Metro Manila is built around the City of Manila. Roads are classified as local, national or subdivision roads. There are ten radial roads branching out from the city. Also there are five circumferential roads forming a series of concentric semi-circular arts around Manila. The circumferential and radial roads are systems of interconnected roads and highways. A problem with the circumferencial roads are the missing road links. These are the roads that are not constructed (yet) to give way for development due to Metro Manila's rapid urbanization. The metropolis is resolving this problem through the completion of missing road links or through the construction of connector roads. A flyover at EDSA on its intersection with Quezon Avenue. South Luzon Expressway, entrance to the Metro Manila Skyway and the PNR railway. According to the Land Transportation Franchising and Regulatory Board, public ridership in Metro Manila composes of the following: 46% of the people go around by jeepneys, 32% by private vehicle, 14% by bus, and 8% use the railway system. Transportation development in Metro Manila follows the Metro Manila Dream Plan, which consists of building short-term to long-term infrastructure lasting up to 2030 and addressing its issues on traffic, land use and environment. For garbage hauling, the region spent ₱4.221 billion ($93.855 million) in 2013. Quezon City spent the most at ₱994.59 million ($22.115 million) while Pateros, NCR's only municipality, spent the least amount of money on garbage at ₱9.478 million ($210,747). The Maynilad Water Services took over the west zone, which is composed of Manila (excluding the southeastern part of the city), Caloocan, Las Piñas, Malabon, Muntinlupa, Navotas, Parañaque, Pasay and Valenzuela. It also operates in some parts of Makati and Quezon City. Manila Water operates on the east zone, comprising the cities of Mandaluyong, Marikina, Pasig, Pateros, San Juan and Taguig. It also operates in large areas of Makati and Quezon City and the southeastern part of Manila, which was excluded from the west zone. Formerly, the Metropolitan Waterworks and Sewerage System (MWSS) is responsible for the supply and delivery of potable water and the sewarage system in Metro Manila. It was privatized in 1997 and the region and its immediate surrounding areas was split into the east and west concession. The winning corporations provides the same function of MWSS. Meralco is the sole electric distributor of Metro Manila. It generates its power from the National Power Corporation and other independent power producers in Luzon. Water zones for Metro Manila and the surrounding areas. Maynilad Water Services operates in the red areas while Manila Water operates in the blue areas. 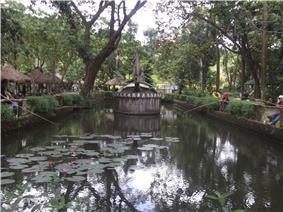 Photo shows a pond in La Mesa Ecopark in Quezon City. La Mesa is an ecological nature reserve and reservoir that supplies potable drinking water to the metropolis. During the first city hood anniversary of San Pedro last December 29, 2014, Guest of Honor MMDA Chairman Francis Tolentino said in his speech that San Pedro is being eyed as the 18th member of Metro Manila. He also said that the proposal will push through at the first meeting of the MMDA Council of Mayors in January 2015. There is a high clamor for the inclusion of San Pedro, Laguna in Metro Manila. Support groups from the local government and non-government organizations are striving to incorporate San Pedro into Metro Manila by the year 2015. 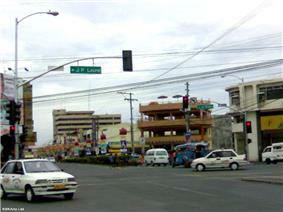 Once incorporated, San Pedro will be the 17th city of the National Capital Region. Primary local government units of Metro Manila, 2012. The seventeen local government units of Metro Manila are administratively equal to provinces. They are composed of sixteen independent cities, classified as highly urbanized cities, and one independent municipality: Pateros. The campus of the Government Service Insurance System in Pasay is the home to the Senate of the Philippines. Meanwhile, the House of Representatives of the Philippines, is based in the Batasang Pambansa Complex, Quezon City along with the Sandiganbayan. Currently, the Coconut Palace serves as the official office and residence of the Vice President of the Philippines. Manila, the capital city of the country, is the home to the Malacañang Palace, the official office and residence of the President of the Philippines. The city is also the home of the Supreme Court of the Philippines. Important national institutions based in Manila are the Court of Appeals, the Bangko Sentral ng Pilipinas, and the Departments of Budget and Management, Finance, Health, Justice, Labor and Employment and Public Works and Highways. Meanwhile, the Department of Science and Technology is based in Taguig while the Department of Tourism has its headquarters in Makati. Important economic and financial institutions headquartered in the region are the Asian Development Bank, Bangko Sentral ng Pilipinas, Development Bank of the Philippines, Land Bank of the Philippines and the National Economic and Development Authority. 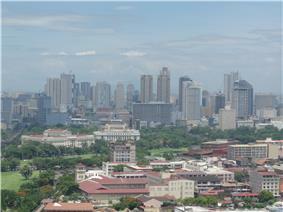 Metro Manila, the National Capital Region, is the seat of the Government of the Philippines. All the main offices of the executive departments of the country are in Metro Manila. The Department of Agrarian Reform, Department of Agriculture, Department of Environment and Natural Resources, National Housing Authority and Philippine Coconut Authority has their main offices based around Quezon Memorial Circle in Quezon City. Commonwealth Avenue near the Sandiganbayan Centennial Building and the Batasang Pambansa Complex, originally a part of the planned new national government center. A bill was introduced in 2014 proposing the creation of a new governing body in Metro Manila to be known as the Metropolitan Manila Regional Administration (MMRA). Unlike the MMDA which is limited to being an administrative coordinating body, the proposed MMRA will have police and other typical municipal powers and is more akin to the Autonomous Region in Muslim Mindanao. The Metropolitan Manila Development Authority (MMDA) is the agency responsible for the delivery of public services in Metro Manila. Its services are limited to traffic management and garbage collection. Metro Manila's, and in general the country's main sport is basketball. Another popular sport in the city are cue sports, and billiard halls are found in many places. Baseball, volleyball, Football and swimming are also widely played sports. NCR has been the champion of the Palarong Pambansa for 13 straight years. Two national sports complex is located in the region, the Rizal Memorial Sports Complex and the PhilSports Complex. The Wack Wack Golf and Country Club has hosted major tournaments such as the Philippine Open and the World Cup. Prominent sporting venues in Metro Manila include the Smart Araneta Coliseum, Mall of Asia Arena, Filoil Flying V Arena and the Cuneta Astrodome. The Greater Manila Area is also home to the Philippine Arena located in Ciudad de Victoria, Bulacan is the world's largest indoor arena with a maximum capacity of 55,000 people. The National Capital Region is the home to the headquarters of the ASEAN Basketball League, Baseball Philippines, Philippine Basketball Association, Philippine Super Liga, Shakey's V-League and the United Football League. Collegiate leagues based in the National Capital Region are the Colleges and Universities Sports Association, National Athletic Association of Schools, Colleges and Universities, National Collegiate Athletic Association, National Capital Region Athletic Association, State Colleges and Universities Athletic Association, Universities and Colleges Athletic Association, University Athletic Association of the Philippines, Women's National Collegiate Athletic Association and the Men's National Collegiate Athletic Association. The Smart Araneta Coliseum in Araneta Center, Cubao in Quezon City. 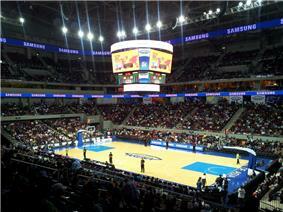 A Philippine Basketball Association game held at the Mall of Asia Arena in Pasay. Prominent museums in Metro Manila include the Ayala Museum, Bahay Tsinoy, Casa Manila, Lopez Museum, Metropolitan Museum of Manila, The Mind Museum, Museo Pambata, Museo Valenzuela, Museum of Philippine Political History, Pasig City Museum and the Rizal Shrine. Metro Manila is the home to the National Museum of the Philippines, the national museum of the country. It is located in the grounds of Rizal Park just outside Intramuros. The National Museum complex include the National Art Gallery, the Museum of the Filipino People and the Museum of Natural History. The National Museum Complex occupies the place and buildings that is formerly a part of a new capital center proposed by Daniel Burnham in 1901. The National Museum of the Philippines. The famed Manila Metropolitan Theater, also known as The Met, was constructed in 1931 and was known as the "Grand Dame" among all the Art Deco theaters of Manila. Years of neglect forces its closure in 1996. The Met will be restored through a tripartite agreement with the National Commission for Culture and the Arts, the National Museum of the Philippines and the Escuela Taller. Metro Manila is the home of the Cultural Center of the Philippines, the national cultural center of the country. Aside from CPP, other popular performing arts venue include Cuneta Astrodome, Mall of Asia Arena, Rizal Park, Quezon Memorial Circle and SMART Araneta Coliseum. Other venues used are the UPFI Film Center and UP Theater in the University of the Philippines Diliman. The Main Theater of the Cultural Center of the Philippines is named after composer Nicanor Abelardo. On the extreme right is the house curtain based on Hernando Ocampo's Genesis. Metro Manila is widely celebrated in popular lore, frequently the setting for mostly Filipino books, movies, and television programs. Flores de Mayo is widely celebrated throughout all the places in Metro Manila. The yearly Metro Manila Film Festival, inaugurated in 1966, is the forerunner of all Philippine film festivals. The Manila, Quezon City, District II, District III and District IV. Metro Manila has the highest rate of crime in the country in 2014, with 59,448 crimes reported (excluding crimes reported in barangay level) with 25,353 of these crimes committed against persons. Following criticisms of high crime rate in Metro Manila, the Philippine National Police launched a relentless anti-crime drive that resulted in the decrease of crimes in the metropolis. As of March 2015 Metro Manila's crime rate is down by 50%. From an average of 919 crimes reported weekly, it has gone down to 412. Recorded robberies and theft also decreased by 63 in just a month. All the 159 police community precincts of Metro Manila will be using the electronic blotter system in recording crimes starting June 2015. The Philippine National Police is responsible for law enforcement in the country. Its headquarters is located at Camp Crame in Santolan, Quezon City. The National Capital Region Police Office (NCRPO) is the regional branch of PNP that operates in NCR. Its headquarters is located at Camp Bagong Diwa in Bicutan, Taguig. Under the supervision of NCRPO, Metro Manila is divided into five police districts. 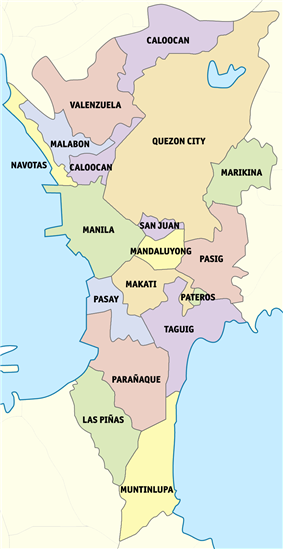 The five police districts are the Northern Police District (Caloocan, Malabon, Navotas, Valenzuela), Eastern Police District (Mandaluyong, Marikina, Pasig, San Juan), Manila Police District (City of Manila), Southern Police District (Las Piñas, Makati, Muntinlupa, Parañaque, Pasay, Taguig, and Pateros) and Quezon City Police District (Quezon City). East Avenue in Quezon City is the location of prominent national health centers: the Lung Center of the Philippines, National Kidney and Transplant Institute, and the Philippine Heart Center. Other national special hospital in Metro Manila include the Philippine Orthopedic Center in Quezon City, and the National Center for Mental Health in Mandaluyong. The Philippine General Hospital, the country's premier state-owned tertiary hospital is located at the City of Manila. The St. Luke's Medical Center which operates in Quezon City and Taguig, is a private tertiary referral hospital cited as one of the best hospitals in the world. NCR is designated by the Department of Health as the pioneer of medical tourism, expecting it to generate $1 billion in revenue annually. However, lack of progressive health system, inadequate infrastructure and the unstable political environment are seen as hindrances for its growth. Under the Philippine Medical Tourism Program, there are 16 participating hospitals (private and public) in Metro Manila with a total number of 6,748 beds as of 2013. Five out of six hospitals in the country accredited by the Joint Commission International are in the region, these are the Asian Hospital and Medical Center, Makati Medical Center, St. Luke's Medical Center – Global City, St. Luke's Medical Center – Quezon City and The Medical City. The headquarters of the Department of Health, the national health department, is also in the region. Healthcare in NCR is mostly provided by private corporations. 72% of Metro Manila's hospitals are privately owned. As of 2009, the region has 179 hospitals. Quezon City has the most number of hospitals while Valenzuela and Pateros do not have any. In 2008, government health workers in NCR comprises 590 doctors, 498 dentists, 4,576 nurses, and 17,437 midwives. Furthermore, Metro Manila has 27,779 beds with a ratio of 2.47 per 1,000 population as of 2008. NCR has the lowest malnutrition rate among all the regions in the country. St. Luke's Medical Center – Global City in Taguig, named as one of the best hospitals in the world. For the school year of 2008-2009, Metro Manila has 511 public elementary schools and 220 public secondary schools. There are 309 tertiary (public and private) institutions as of the year-end of 2009. For the said school year, enrollment in public elementary schools is at 1,219,333, public secondary schools at 661,019 and 687,096 for tertiary (public and private) institutions. NCR has the highest literacy rate among all the regions of the Philippines, with 99.2% in 2008. Literacy rate for males is at 99.0% while literacy rate for females is at 99.4%. Primary and secondary education is in the region is governed by the Department of Education-National Capital Region (DepEd-NCR). Meanwhile, the higher educational institutions are under the CHED-National Capital Region. Prominent secondary schools in Metro Manila include the Philippine Science High School in Diliman, Quezon City, the national science school of the Philippines and the Manila Science High School in Ermita, the forerunner of all the science schools in the country. Since the colonial period, Manila has been the center of education. The University of Santo Tomas (1611), Colegio de San Juan de Letran (1620), Ateneo de Manila University (1859) are some of the educational institutions established during the colonial period. The country's national university, the University of the Philippines, along with several state colleges and universities calls the region as its home. Manila's University Belt in the form the largest concentration of higher education institutes in the Philippines, making Manila the center for higher learning in the country. University of Santo Tomas is the oldest extant university in Asia which was established in 1611. University of the Philippines Diliman is the flagship campus of the national university of the Philippines. Some of the country's oldest schools are founded in Intramuros, these are the University of Santo Tomas (1611), Colegio de San Juan de Letran (1620), and Ateneo de Manila University (1859). Only Colegio de San Juan de Letran (1620) remains at Intramuros; the University of Santo Tomas transferred to a new campus at Sampaloc in 1927, and Ateneo left Intramuros for Loyola Heights, Quezon City (while still retaining "de Manila" in its name) in 1952. Other prominent educational institutions include the Manila High School and the University of the City of Manila. Popular tourist destinations in Intramuros include the Baluarte de San Diego, Club Intramuros Golf Course, Cuartel de Santa Lucia, Fort Santiago, Manila Cathedral, Palacio Arzobispal, Palacio de Santa Potenciana, Palacio del Gobernador, Plaza Mexico, Plaza de Roma, San Agustin Church and its newest tourist attraction, the Ayuntamiento de Manila. The architecture of Intramuros reflects the Spanish colonial style and the American neoclassical architectural style, since the Philippines was formerly a colony of Spain and the United States before it is granted its independence in 1946. Kalesa is a popular mode of transportation in Intramuros and nearby places such as Binondo, Ermita and the Rizal Park. 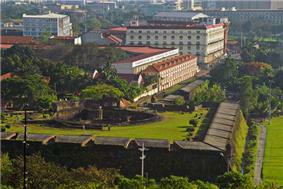 Intramuros is the historic center of Manila. Originally, it was considered to be Manila itself at the time when the Philippines was under the Spanish Empire colonial rule. Owing to its history and cultural value, Intramuros and Rizal Park are designated as flagship destination to become a tourism enterprise zone in the Tourism Act of 2009. Intramuros is managed by the Intramuros Administration (IA). The Manila Cathedral, established in 1571, in its eighth and current incarnation that was finished in 1958. Gambling in Metro Manila has also become a popular tourist attraction in the region. Metro Manila is a popular gaming destination in Asia, rivaling other major gaming destinations such as Macau and Singapore. There are around 20 casinos in the metropolis, featuring luxurious casino hotels and integrated resorts. 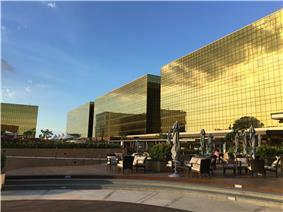 Its thriving local gambling market makes Manila attractive to casino operators. Popular gaming destinations are Entertainment City in Bay City, Parañaque which contains the City of Dreams Manila and Solaire Resort & Casino, and Newport City in Pasay. Metro Manila will open 4,612 hotel rooms this 2015. It is also expected to exceed the 3,500 annual addition of hotel rooms in the next two years. Global Blue ranked Manila as one of the "Best Shopping Destinations" in Asia. Metro Manila is home to some of the largest shopping malls in the world, three of which are in the top 10. SM Megamall in Mandaluyong ranks as the 3rd largest shopping mall in the world, followed by SM City North EDSA in Quezon City bragging the 4th place. Meanwhile, SM Mall of Asia in Pasay ranks as the 9th largest shopping mall in world. Other shopping malls in Metro Manila in the list of the largest shopping malls in the world are the Ever Gotesco Commonwealth Center, Festival Supermall, Greenbelt, Market! Market!, SM Aura Premier, SM Southmall and TriNoma. Tourism is a vital industry of the region. Metro Manila is the main gateway to the Philippines. Trade and tourism represents 31.4% of share of NCR's output by industry according to Brookings Institution. Metro Manila welcomed 974,379 overnight visitors in 2012, making it the top overnight tourist destination of the country. Manila is visited by the majority of international tourists coming to the country registering a total of 3,139,756 arrivals in 2012. Eastwood City, located at the Bagumbayan area of Quezon City, meanwhile is a state-of-the-art residential, commercial, business and entertainment complex developed by Megaworld Corporation in Bagumbayan, Quezon City. It is the first cyberpark in the Philippines. The Araneta Center, Eastwood City, both located in Quezon City are the secondary business districts of Metro Manila. Araneta Center is a secondary business district developed by the Araneta Center, Inc. which is owned by the Araneta family. 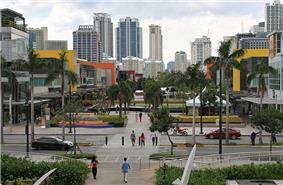 Shopping malls in the place include Gateway Mall, Ali Mall, Farmers Plaza, Farmers Market and SM Cubao. Its centerpiece is the Smart Araneta Coliseum, one of the largest indoor coliseums in Asia and the main venue of the Philippine Basketball Association. Ortigas Center is the central business district located in Mandaluyong and Pasig, with a small portion of it located in Quezon City. Landmarks in Ortigas include the EDSA Shrine, Shangri-La Plaza and the SM Megamall. Furthermore, The Medical City has its main campus in Ortigas Center. Important financial and national institutions headquartered in Ortigas are the Asian Development Bank, Union Bank of The Philippines and the National Economic and Development Authority. Ortigas is also the home to the headquarters of San Miguel Corporation, Jollibee Foods Corporation, Lopez Group of Companies and The Manila Electric Company. Ortigas Center, showing the portion of Barangay San Antonio in Pasig. Bonifacio Global City is the newest business district of Manila and is the premier financial and lifestyle center of the metropolis. 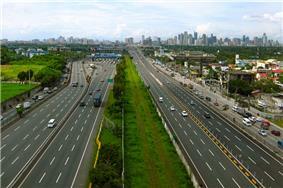 It is located between Makati and Taguig City. Formerly it was a military base known as Fort Bonifacio. The Bases and Conversion Development Authority (BCDA) privatized the property and its income from the sale was intended to be used for the modernization of the Armed Forces of the Philippines. Upon its privatization, the place was transformed it into a business hub featuring numerous tourist attractions such as The Mind Museum, high-end shops, towering office skyscrapers, and luxurious lofts and condominiums. Bonifacio Global City will overtake the Makati Central Business District as the premier financial center of the country in the future. One of the reasons for it is that the Philippine Stock Exchange will relocate its headquarters in BGC. Also, it has more spaces and land for future developments. It is also the most active business district, generating over 50 percent of the growth in property market and has more available space for rent or lease and sale than Makati. Makati, the sixteenth most populous city in the Philippines, is the premier business and commercial center of the Philippines. The Central Business District is the headquarters to most of the multinational corporations residing in the Philippines as well as the country's biggest commercial firms and BPO companies. The Central Business District has an office stock of 1.1 million square meters of Grade A and premium office space. It is the home to the tallest skyscrapers in the region as well as in the country. Metro Manila has plenty of mixed-use developments owned and developed by private corporations such as the Ayala Corporation, Megaworld Corporation and SM Prime Holdings. Ayala Land owns and develops Arca South in Taguig, Ayala Center in the Central Business District, Circuit Makati, and The Cloverleaf, Vertis North and U.P.–Ayala Land TechnoHub in Quezon City. Meanwhile, the Lucio Tan led Eton Properties owns and develops Eton Centris in the corner of EDSA and Quezon Avenue in Quezon City. Prime business and commercial centers in the metropolis are Makati, the country's premier financial center, Bonifacio Global City, Ortigas Center, Quezon City, Manila, Pasay and Alabang. The minimum wage of Metro Manila is at ₱481 ($10.77) for non-agricultural workers and at ₱444 ($9.94) for those working in the agricultural sector, the highest minimum wage among all the 17 regions of the country. Historically, the main business district of the metropolis was Binondo, where commercial trading flourished since the 15th century. By the 1960s, economic activities shifted from Binondo to Makati. 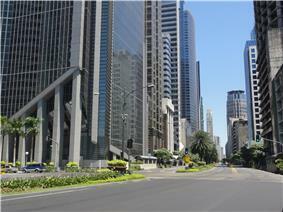 It transformed Makati it into one of the leading financial centers in Asia. Still, Binondo remained as a cultural and financial center because of the vast Chinese population residing and doing business in the area. Metro Manila makes it to the "Global Top 30" cities according to property consultancy firm Jones Lang Lasalle, citing its economic scale, vast population, large gross domestic product and BPO specialization as its competitive edge. Furthermore, the region ranks 3rd for the top business process outsourcing global destinations, next to Bangalore and Mumbai. The region's retail sector remains strong, bolstered by remittances abroad, BPOs, and its tourism sector. Metro Manila will add 1.85 million square meters of office spaces between 2015 and 2017 in the central business districts in Makati, Taguig, and Quezon City as more global firm such as Google and HSBC seeks to outsource business process in the Philippines. The vacancy rate for office spaces remains low, at less 3% in the year-end of 2014. Manila remains as the least expensive capital city in the Asia-Pacific to occupy prime office space at an average rent of $22 per square meter per month. Old downtown district of Manila. The National Capital Region accounts for 37.2% of the gross domestic product of the Philippines in 2013. Furthermore, it has the highest per capita GDP of the country at ₱183,747. The employment rate of NCR is at 89.6% as of 2012. According to Brookings Institution, the 2014 share of output by industry in Metro Manila is as follows: trade and tourism: 31.4%, business/finance: 28.6%, local/non-market: 15.6%, manufacturing: 12.5%, transportation: 4.9%, construction: 4%, utilities: 2.8%, and commodities: 0.3%. 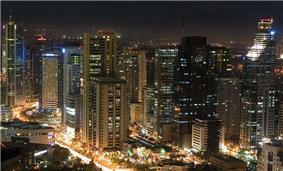 Makati is the sixteenth most populous city in the Philippines. It is the prime business and commercial center of the country. The most populous cities in Metro Manila are Quezon City (2,761,720), Manila (1,652,171), Caloocan (1,489,040), Pasig (669,773), Taguig (644,473), Parañaque (588,126), Valenzuela (575,356), Las Piñas (552,573), Makati (529,039) and Muntinlupa (459,941). The National Capital Region has a population of 7007118559750000000♠11,855,975 as of May 2010. Its total urban area, composing of the urban agglomeration which refers to the continuous urban expansion of Metro Manila into the provinces of Bulacan, Cavite, Laguna and Batangas has a population of 7007241230000000000♠24,123,000. It is the most populous region in the Philippines, the 7th most populous metropolitan area in Asia, and the 3rd most populous urban area in the world. In 2012, the AFP Joint Task Force-National Capital Region was launched to ensure peace and stability in Metro Manila, bearing the same function of the deactivated National Capital Regional Command, although it operates on a much smaller size than its predecessor. The Philippine Coast Guard has their headquarters at Port Area, Manila. The Coast Guard NCR District has its headquarters in Manila and has another Coast Guard Station in Pasig. It also has a base in Taguig and maintains several detachments located in Navotas, Parañaque, Tangos, Vitas, Manila North Harbor, Manila South Harbor and the Cultural Center of the Philippines. The Philippine Army has their headquarters at Fort Bonifacio, Taguig. The Villamor Air Base in Ninoy Aquino International Airport is the home to the headquarters of the Philippine Air Force while the headquarters of the Philippine Navy is located at Roxas Boulevard, Malate, Manila. The headquarters of the Armed Forces of the Philippines is located at Camp Aguinaldo, along with the Department of National Defense, in Murphy, Quezon City. Aside from Camp Aguinaldo, other military bases situated in the region are Camp Atienza and Fort Bonifacio. 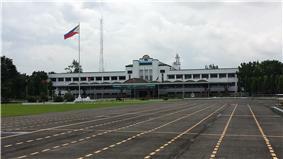 The General Headquarters Building of the Armed Forces of the Philippines. The Las Piñas-Parañaque Critical Habitat and Ecotourism Area (LPPCHEA) was declared as a critical habitat by the Government of the Philippines in 2007 and was listed by the Ramsar Convention as a Wetland of International Importance in 2013. LPPCHEA is composed of the Freedom Island in Parañaque and the Long Island in Las Piñas that covers 175 hectares and features a mangrove forest of eight species, tidal mudflats, secluded ponds with fringing salt-tolerant vegetation, a coastal lagoon, and a beach. La Mesa Ecopark is a 33-hectare well-developed sanctuary around the La Mesa Watershed. It was established through a joint partnership between the Metropolitan Waterworks and Sewerage System, ABS-CBN, and the Quezon City Government. La Mesa Ecopark, along with the Ninoy Aquino Parks & Wildlife Center, are important nature reserves in the Philippines. Founded in 1959, Manila Zoo is the oldest zoo in Asia. It is the home to more than a thousand animals from different 90 species including the 40-year-old elephant, Mali. The zoo has an average of 4,000 visitors weekly. An estimated 40,000 tourists visits the zoo each month. 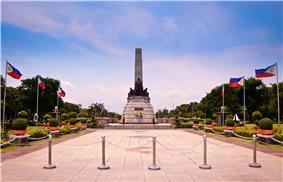 Rizal Park, also known as Luneta Park, is considered as the largest urban park in Asia. In the Tourism Act of 2009, Rizal Park along with Intramuros are designated as flagship destination to become a tourism enterprise zone. A new attraction called Paseo de Manila is expected to rise in Rizal Park. On the other hand, Paco Park is a recreational garden which was once Manila’s municipal cemetery built by the Dominicans during the Spanish colonial period. NCR has three listed protected areas, these are the Rizal Park, Ninoy Aquino Parks & Wildlife Center and the Manila Bay Beach Resort. There are two national parks in Metro Manila which is managed by the National Parks and Development Committee, the Rizal Park and Paco Park in Manila. Formerly, NPDC manages Fort Santiago in Intramuros and the Quezon Memorial National Park in Quezon City. Because of a tripartite agreement between the Quezon City Government, the National Historical Institute and the NPDC, the management of Quezon Memorial National Park was transferred to the Quezon City Government while the maintenance of Fort Santiago is transferred to the Intramuros Administration. According to the Köppen climate classification, NCR features tropical wet and dry climate and tropical monsoon climate. Metro Manila has a relatively short dry season from January through May, and a lengthy wet season from June through December. Metro Manila is prone to earthquakes because it is surrounded by active faults including the Marikina Valley Fault System. Other distant faults such as the Philippine Faults, Lubang Faults, Manila Trench and Casiguran Faults, are a threat as well. Because of the natural disasters that poses a threat to Metro Manila, Manila was ranked as the second riskiest capital city after Tokyo to live in according to Swiss Re. Metro Manila is located in the southwestern portion of Luzon. The region lies along the flat alluvial lands extending from the mouth of the Pasig River in the west to the higher rugged lands of Marikina Valley in the east. The region is geographically divided into 4 zones: the Coastal Margin, Guadalupe Plateau, Marikina Valley, and the Laguna Lowlands. The Coastal Margin that faces the Manila Bay possesses resources for offshore fisheries and fishpond development. The various reclamation projects in the area are meant for mixed-use urban development. The Guadalupe Plateau is the most adaptable to urban development activities not only because of its solid geographical foundations but also because of its existing infrastructure links with the rest of Luzon. The Marikina Valley has fertile land suitable for crop cultivation while the Marikina River provides water for industrial uses and discharge. The Laguna Lowlands is not only suitable for agriculture and aquaculture but also for industrial activity. Riverbanks Center at Marikina River, Marikina. In the year-end of 2014, MMDA Chairman Francis Tolentino proposed that San Pedro, Laguna be included in Metro Manila as its 18th member city. In 1986, President Metropolitan Manila Development Authority. The chairperson of the agency will be appointed by the President and should not have a concurrent elected position such as mayor. Former Laguna province governor Joey Lina was the last to serve as the Officer-In-Charge governor of Metro Manila. After the 8 years of dictatorship, President Marcos was overthrown by the people at a peaceful revolution in EDSA in February 1986, where they stayed there for three days. The movement was known as the People Power Revolution and made headlines such as "the revolution that surprised the world". The EDSA Shrine in Ortigas Center that originally serves as a memorial to the People Power Revolution. President Ferdinand Marcos appointed his wife Imelda Marcos as the first governor of Metro Manila. She launched the City of Man campaign. The Cultural Center of the Philippines, Metropolitan Folk Arts Theater, Philippine International Convention Center, the Lung Center of the Philippines, Philippine Heart Center, the Kidney Center of the Philippines and the Coconut Palace are all constructed precisely for this purpose. The City of Man campaign was discontinued when the Marcos was ousted from power after the People Power Revolution. On November 7, 1975, Metro Manila was formally established through Presidential Decree No. 824. The Metropolitan Manila Commission was also created to manage the region. On June 2, 1978, through Presidential Decree No. 1396, the metropolitan area was declared the National Capital Region of the Philippines. 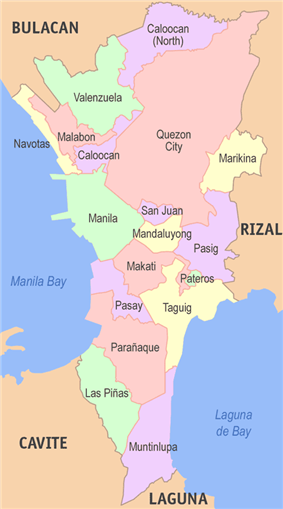 When Metro Manila was established, there were four cities, Manila, Quezon City, Caloocan, Pasay and the thirteen municipalities of Las Piñas, Makati, Malabon, Mandaluyong, Marikina, Muntinlupa, Navotas, Parañaque, Pasig, San Juan, Taguig, Valenzuela and Pateros. At present, all of these municipalities except for one have become an independent charted city, only Pateros remains as a municipality. 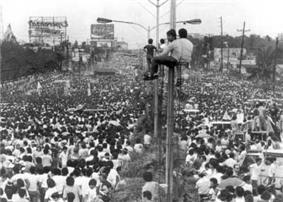 Thousands of people in EDSA during the peaceful People Power Revolution.